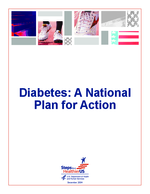 Agencies within the U.S. Department of Health and Human Services (HHS) have developed a number of initiatives to promote detection of diabetes in the U.S. Agencies are also conducting research into the most effective strategies for screening pre-diabetes as well as type 2 diabetes. Diabetes Detection Initiative—This HHS initiative is a community-based effort to identify persons with undiagnosed type 2 diabetes and refer them for follow-up blood testing and treatment, if appropriate. It uses community involvement strategies within health systems in communities throughout HHS regions. It is being pilot tested in 10 locations through 2004. Early diagnosis and proper treatment of diabetes can prevent or delay serious diabetes-related health problems. More information is available at http://www.ndep.nih.gov/ddi. SEARCH for Diabetes in Youth—Rising rates of diabetes among youths are a growing public health concern. The Centers for Disease Control and Prevention and the National Institutes of Health are funding this 5-year, multicenter study to examine the status of diabetes among U.S. children and adolescents. More information is available at http://www.searchfordiabetes.org/index.cfm. Healthy Aging Initiative—A joint project by the Administration on Aging and the Centers for Disease Control and Prevention in which grants are awarded to states to implement evidence-based disease prevention programs at the community level. There are fourteen collaborative projects with State Units on Aging and State Health Departments, including one project focused on diabetes screening, 7 projects focused on physical activity, and three projects focusing on assisting older Americans with disease self-management.